Currently viewing the tag: "Paul Thomas Anderson"
SOMERVILLE – A couple of nights before “Phantom Thread” opened in theaters styleboston’s Tonya Mezrich hosted an exclusive, special screening of the Paul Thomas Anderson movie that stars Daniel Day Lewis as a detail obsessed head of a London fashion house. Here is Tonya’s report: Hosting an advance screening of this Paul Thomas Anderson 1950s drama last night was a real treat. 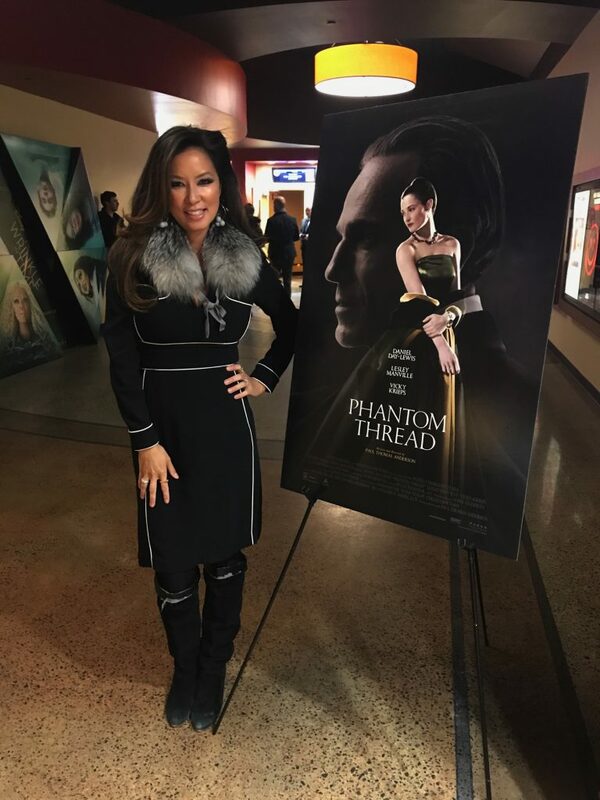 Sixty-five of my dear friends and fashionphiles dressed in their hottest phantom threads gathered at the AMC theater in Assembly Square to get a sneak peek of the film. Touted to be Daniel Day Lewis’ last–he was brought out of retirement and his 10-year cobblership to get back together with Anderson to make this movie together. The period and the setting are depicted so realistically that you can imagine this fictional movie being based loosely on reality—think an over-the-top version of Christian Dior or Oscar de la Renta. Having developed and run my own fashion house (but on a much smaller scale) years ago, the realism of the measuring, the fittings, the backstage chaos of a fashion show and ruining your piece de resistance hours before its intended delivery is all so accurate that it makes it hard to believe that it is indeed fiction. Editor’s note: Keep checking our pages as we continue to partner with those who bring you the best in lifestyle, arts and entertainment. The Boston Globe’s review goes even further than Tonya on recommending “Phantom Thread,” you can read it here.